It’s an opportunity to “work in concert with the President and federal officials on advancing my administration’s priorities,” Dunleavy says. Gov. 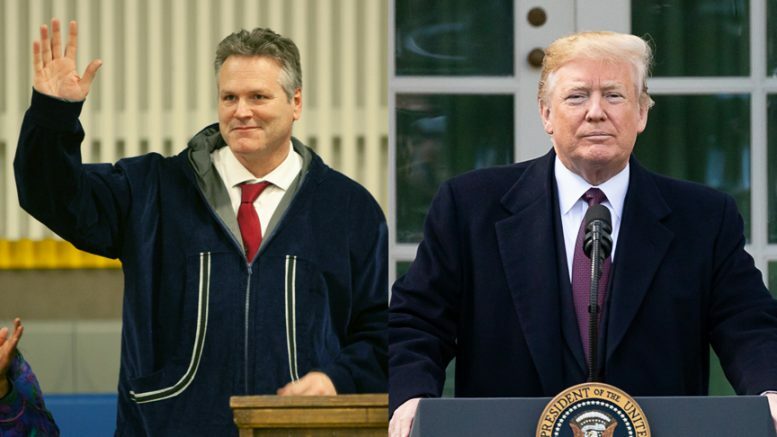 Mike Dunleavy’s administration announced Alaska’s new governor will be traveling to Washington, D.C., later this week to meet with President Donald Trump. Trump will be hosting a meeting with the country’s incoming governors on Thursday, as is tradition for the nation’s chief executive. President Barack Obama hosted former Gov. Bill Walker in 2014. “This is the first of many opportunities to work in concert with the President and federal officials on advancing my administration’s priorities, like bringing new jobs and investment to Alaska,” Dunleavy said in a prepared statement. Trump endorsed Dunleavy during a flurry of tweeted endorsements. That’s also not to mention the ongoing battles over the federal budget, which is stuck in gridlock over the president’s demands for border wall funding to be included in the spending. There’s been some concern that the money could come out of funding that’s been set aside for federal icebreakers. With the country’s icebreaker fleet aging and lagging far behind the Russian fleet it’s a major priority for Alaska, particularly when it comes to “jobs and investment” in the Arctic. Be the first to comment on "Trump to meet with Gov. Dunleavy and nation’s new governors"